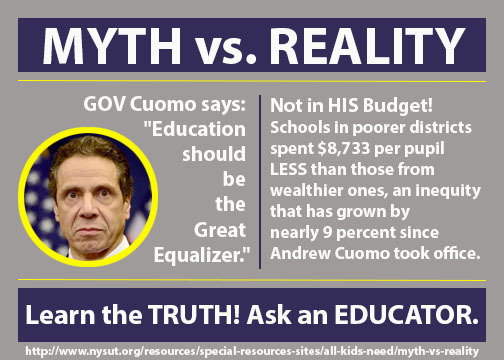 Brian Regan, a librarian at Barker Road Middle School and member of Pittsford District Teachers Association created the infographics above based on NYSUT's Myth vs. 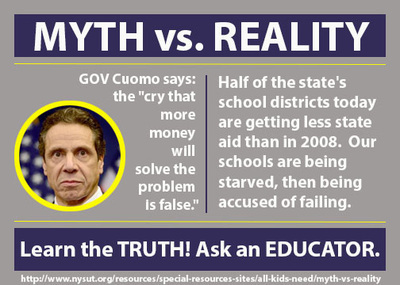 Reality fact sheet. We encourage you to share them on social media. Thank you, Brian - and thanks to PDTA President Jolene DiBrango for the heads up! 13 things you can do right now to fight back. 1. Take action on this week's campaigns.The latest actions will always be right here in the No. 1 spot. How much do Gov. Cuomo and New York state owe your school district? Find out - and share! 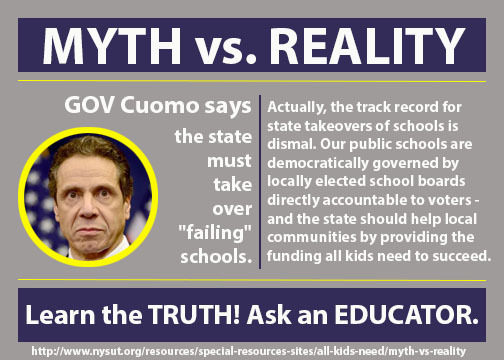 VIDEO: Contribute now to the "Call Out Cuomo" fund. Watch it! Share it! 2. Call your state senator. Now. Sign up for MAC text alerts!Take 10 seconds and sign up for MAC text alerts on your phone! STEP 1: Text the word "NYSUT" to the contact number 38470. STEP 2: That's it! There is no Step 2! 4. Sign up for the in-district lobby day on Feb. 12. Take part in a face-to-face meeting at your state legislator's local office. 5. Call out the governor. 6. Get connected to the MAC. 7. Get connected on Facebook. 8. Get connected on Twitter. Once a day (or as often as possible) tweet your thoughts to #CallOutCuomo on what #AllKidsNeed - more science labs, music and art classes, school libraries, smaller class sizes and more. We're reminding the governor to focus on what matters! Follow the conversation in real-time for some great examples from parents and educators. NYSUT local union presidents may order in bulk at orders@nysutmail.org. 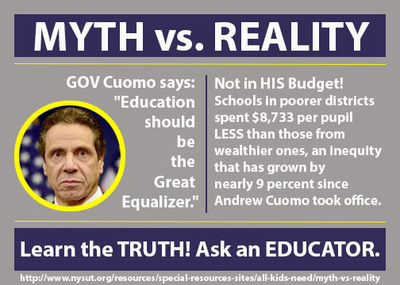 Wear and share NYSUT's Respect Public Education: It Works! button that Gov. Cuomo prohibited at his recent public appearances.Seriously. 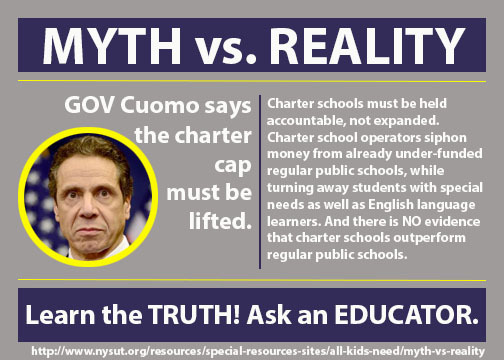 Your local union president can order buttons in bulk via email to orders@nysutmail.org. 11. Take part in community forums. 13. Support "Take Action Tuesday." 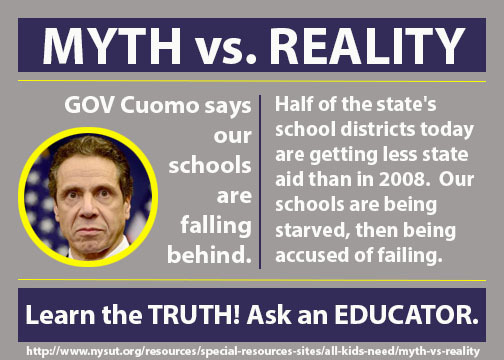 Check www.nysut.org/allkidsneed for frequent updates!